A man from Frome, England, beheld a peculiar sight on May 29. A bright light, leaving a long, sparkling trail, was circling in the sky near the town, about 100 miles west of London, according to Somerset Live. He spotted the light over the Cley Hill area, which is known for its strange sightings, including crop circles and lights in the sky. A few days later, another video emerged, apparently showing the same object. It was captured by a man from a nearby town of Warminster, who submitted it to SecureTeam10, a Youtube channel reporting on UFO sightings. The first witness speculated it may have been a drone with something tied to it to create the lighting effect, like a flare or a firework fountain. The problem is, a flare only leaves a smoke trail, not a sparkling one. And even large firework fountains usually last about a minute and seem to leave much shorter tail. This object appeared to remain in the sky for several minutes, leaving a long, bright, blazing tail. If some drone enthusiast created this spectacle, he or she has done a masterful job. A few years ago, a similar incident was captured on video in Hungary. 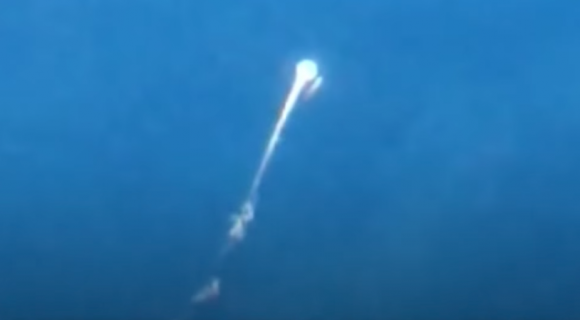 An object which looked like an asteroid ablaze approaching the Earth suddenly changed direction midair and kept descending in the opposite direction. In recent years, with the proliferation of cellphone cameras, videos of UFOs or other strange phenomena have flooded the internet. Many are explained away or debunked as scams, but many others remain unexplained, provoking curiosity, intrigue, and speculation.